This Latvian vocabulary book contains more than 3000 words and phrases which are grouped by topic to make it easier for you to pick what to learn first. On top of that, the index in the second half of the book provides you with a basic Latvian-English as well as English-Latvian dictionary which makes this a great resource for learners of all levels. This is the main part of the book and represents a list of chapters each containing Latvian vocabularies for a certain topic. The Latvian vocabularies in the chapters are unsorted on purpose to separate remembering them from a defined alphabetical order. You can start at any chapter and dive directly into the topics that interest you the most. The index in the second half of the book can be used as a basic Latvian dictionary to look up words you have learned but can't remember or learn new words you need. Not sure where to start? We suggest you first work your way through the verbs, adjectives and phrases chapters in part one of the book. This will give you a great base for further studying and already enough vocabulary for basic communication. 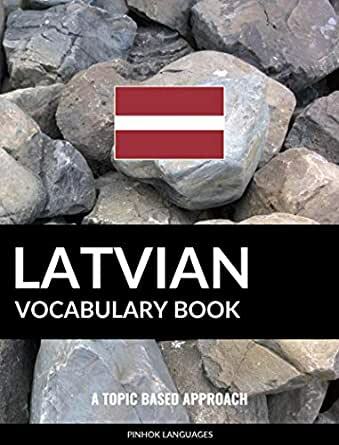 The Latvian dictionaries in part two and three can be used whenever needed to look up words you hear on the street, English words you want to know the Latvian translation for or simply to learn some new words. Vocabulary books have been around for centuries and as with so many things that have been around for some time, they are not very fashionable and a bit boring, but they usually work very well. Together with the basic Latvian dictionary parts, this vocabulary book is a great resource to support you throughout the process of learning Latvian and comes in particularly handy at times when there is no internet to look up words and phrases.